Published by Scholastic Canada, 2011. I first told version of the story in 1987 in Geraldton, Ontario. I do not remember the name of the first kid in the story because it was a ‘throw away’ MOOSE story. There were dead MOOSE on cars that came for the show. I kept telling it all through Northern Ontario where I was on tour. It then became one of my favorite tell stories and it had LOTS of different versions. There was the Inuit version where the animal is a Cariboo and the kid shoots and eats it. 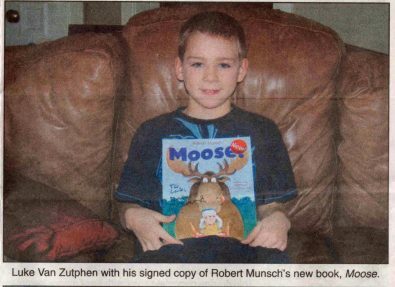 There was the Northern Ontario version where the animal is a MOOSE and the kid wants to keep it for a pet. There was the Toronto version where the animal is a raccoon and the kid calls the police. There was the Texas version were the animal is a Armadillo and the kid wants to keep it for a pet. There was a Plains version were the animal was a Buffalo. Etc. Etc. Etc. Through all this telling my basic story still had the dad ask the kid to give him a gun. Publishers did not like that. Finally Scholastic told me to change the story and get rid of the gun and them they would publish it. Around the same time Greg Jones, who scheduled and travelled with me for show, asked me NOT to tell it because he ALWAYS got at least one parent who freaked out when I mentioned GUNS. This was a problem because I felt that the story had begun in a town where EVERYONE hunted and thought hunting was OK. So I played around with the story and came up with the version that is in the book and finally, after 6 years of asking, Scholastic said “YES”. But the story had no KID. So I had this story and and I had to find a kid for it. WHAT TO DO? I WAS IN A HURRY! Then I remembered a kid named LUKE who had sent me a wonderful letter about his ‘tree house’ which was strangely not in a tree. The letter has all sorts of photographs of Luke and his tree house and that was a perfect background for the MOOSE story. I tracked down Luke’s sister on FACEBOOK and asked her to ask Luke if he wanted to be in a book. So Daniel in Texas did not get in an Armadillo story and the Crockatt family did not get in the Inuit Cariboo version and no school class got in the school class version even though a lot of classes sent me illustrations of it. So take this story and make your OWN version of it, because that is what I would do if I told it you. He yelled“ARMADILLO”, threw his gun up into the air and ran away. Then it ran into the kitchen, took all the carrots out of the refrigerator and ran out the front door and never come back. ©1987 – Bob Munsch Enterprises Ltd.
“Tell your father, of course” said 3 4 5 and 6. So they all ran upstairs. 2’s father was asleep like this: ZZZZZ, ZZZZZ, ZZZZZ, ZZZZZ. 2, 3, 4, 5, and 6 said very quietly, “DADDY”. He still didn’t wake up; so: they all took off a shoe and wapped the father on the head. 2, 3, 4, 5, and 6 said, “In our back yard is a large, enormous MOOSE”. “This is crazy”, said the father, “There IS no moose in our back yard”. Well, that frightened the moose and it jumped right up in the air and came down on 2’s father. “Tell your mother” said 7, 8, 9, 10, 11, 12 13 and 14. They ran upstairs and 2’s mother was asleep like this: ZZZZZ, ZZZZZ, ZZZZZ, ZZZZZ. She had been playing bingo till 3 in the morning. “In the back yard”, said 2, 7, 8, 9, 10, 11, 12 13 and 14 “is a large enormous MOOSE”. “Don’t be ridiculous”, said the mother, “There is no moose in our back yard. Moose are very shy animals and they stay in the forest”. Well, that frightened the moose and it jumped right up in the air and came down on 2’s mother. 2 wanted to get that moose off her mother. So they all ran into the kitchen, opened the refrigerator and each got a big orange carrot. 2, 15. 16. 17. 18. 19 and 20 held them out the door and said, “Here Moosie, Moosie, Moosie”. The moose came over and smelled 15’s carrot, “Sniff, sniff, sniff, sniff”. 2 said, “I think I like this moose”. 2 said, “I wanna keep him for a pet”. 2 ran out in the street and yelled “A Moose! A Moose! A Moose! I want a Moose for a pet. A police car came very fast and three policemen ran into the house. “Where is the MOOSE” yelled the policemen. “In the Backyard” yelled all the kids. The policemen ran into the backyard and saw the very large MOOSE and freaked out. They ran around in circles, threw their guns in the air and ran down the street. 3, 10, and 17 caught their guns. Then it ran into the kitchen, took all the carrots out of the refrigerator, ran out the front door and down the street. “Maybe it went to the school!” said 3, 5 , 7, 13, 16 and 20 “Maybe it’s in the playground. THIS IS A MOST ADAPTABLE STORY AND I SUGGEST YOU PLAY AROUND WITH IT. And here is Luke with a signed copy of the book.